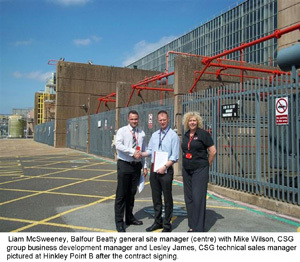 Balfour Beatty Services has awarded Cleansing Service Group (CSG) a contract to collect waste from the Hinkley Point B power station complex in Somerset. The contract involves the collection of a wide range of hazardous and non-hazardous waste streams including solvents, aerosols, antifreeze, thinners, battery water, oily rags and absorbent spills materials. CSG will also be providing spills response, tank cleaning and sewage collection services. The waste will be transported to CSG’s award winning treatment and disposal facility at Cadishead, Manchester, where the great majority of the waste streams will be processed and made suitable for re-use. Waste oily water will be collected by the company’s Bristol depot where it will be separated and the oil sent for recycling. CSG group business development manager Mike Wilson said the companies would work closely together to ensure the maximum volume of waste was recycled. Balfour Beatty is an international infrastructure group and its Services operation has a long term contract with EDF Energy to provide facilities management services to a number of EDF’s UK power generation and support sites including Hinkley Point.